July 2, 2015 by Ecommerce News. About Statistics with tags Spain. 7924 views. In Spain, almost seven out of ten internet users, which corresponds to 19.2 million Spaniards, shop online. And the average online consumer orders something online three times per month, while spending an average of 70 euros per order. In 2013, it was just 44 percent of the internet users in Spain who shopped online. Now, two years later it’s 67 percent, or a percentage point increase of 23 percent, a new study from IAB shows. The interactive advertising bureau also looked at the purchase frequency and the average order value. Spanish consumers shop on average 2,8 times per month (in 2003: 2,3) with young people shopping even more: consumers between 16 and 30 years old shop online on average 3,4 times per month. Nonetheless, it’s still 56 percent of online consumers who shop online only once, or less, per month. As for the average online order value, it’s now seven euros more than it was in 2013 (from €63 to €70). Although young consumers tend to shop online more often, it’s the older consumers who spend more. The shoppers who are between 40 and 55 years old spend on average €85 per order. Also, 42 percent of online consumers spend between €101 and €150, while 16 percent spends between €151 and €500. IAB also asked respondents why they make online purchases. 86 percent said because of certain offers that are only online. For 79% it’s also because online shopping is cheaper. The old-fashioned desktop pc is still a very popular device in Spain, when it comes to shopping online. 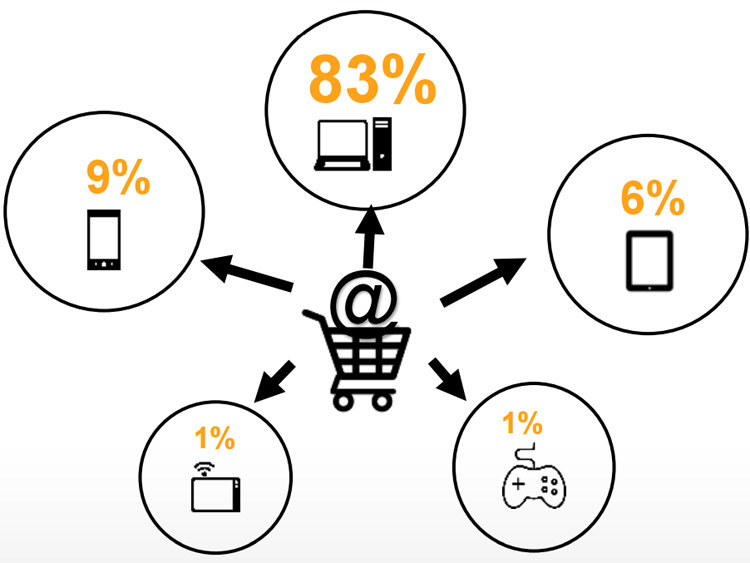 IAB asked: “For the past ten purchases you made online, how many have you conducted from these devices?”, and 83% answered with the desktop computer. The smartphone was used in 9% of the time, while the tablet ranked third with 6%. According to IAB, using apps for online purchases happening from a mobile device increased significantly compared to 2013. When asked “Considering the last ten purchases you made on your mobile phone, how many have you made from an app or in a web browser?”, it showed that 40 percent of consumers uses an app, which is 15 percentage points more than in 2013 (25%). Especially men tend to use apps when shopping online, as this option is used by 43 percent of them, while for women using apps is less popular (34 percent). Popular product categories in the Spanish ecommerce are Technology/Communication, Leisure/Culture and Travel/Holidays. Products from these categories were bought by respectively 68 percent, 66 percent and 64 percent of respondents.